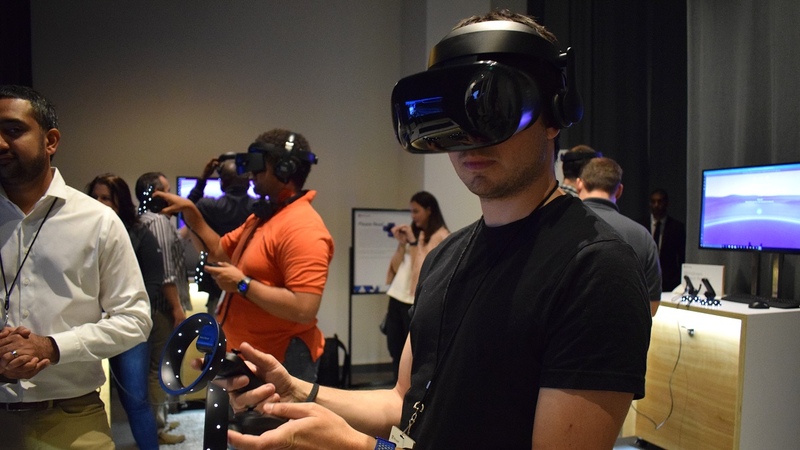 At its Mixed Reality event in San Francisco, Microsoft unveiled the last of its partner headsets that will be available this year, the Samsung Odyssey. Far from the least of the bunch, Samsung's headset tops out the entire group on specs, and having taken it for a short demo, it's easily the best Windows MR headset I've tried. So first, a little context. When Microsoft introduced the Windows Mixed Reality platform, it was all about making VR more affordable and easier to use. For the most part that's still the case, but Samsung's offering something at the opposite end to Acer's HMD, with something more comparable to the Oculus Rift. It has OLED displays, a 1400 x 1600 (per eye) resolution, integrated headphones and even a mic. It is the new MR headset to beat. Like the others in Microsoft's gang, the Odyssey is tethered to, and powered by, your PC, and the experience you get will depend on the oomph of your machine. Microsoft offers two tiers of quality to account for different levels of horsepower, 'Windows Mixed Reality' and 'Windows Mixed Reality Ultra', neither of which will be affected by your choice of MR headset. That means most of the differences we've seen between headsets so far have been cosmetic, with a little variation in field of view. Samsung offers 110 FOV, which is the same as Dell's and Lenovo's, but higher than HP's and Acer's. Samsung is offering the highest resolution of all of them, though. Yet all of these headsets have an edge over the Rift (and the Vive) in that you don't need to set up external cameras. All of the tracking is done from within the headset, making Samsung's experience all the more impressive. As for the quality of the VR, I got to try out the new Halo Recruit, a target practice set within the Halo universe. On visual quality, it felt as good as many other high-end games I've played on Rift or the Vive, even though those two have more of an edge on resolution. Windows Mixed Reality also has a (limited) play space to move around in; though the constraints of the demo room meant I couldn't explore this as much as I wanted, I was able to walk around a little bit. I then did the exact same thing on the HP to compare, and the difference was striking. It took longer to get the HP to a place it was comfortable, and even then the reduced field of view was noticeable, while I had to adjust the headset more than once when it budged slightly out of focus. Where some of the Microsoft's partner headsets fall down is in comfort – most notably HP's – but with its headphones built in, and an easily adjustable dial for tweaking the distance between lenses, the Odyssey is premium, snug and easy to slip on and get going with. To go back to my earlier point, though, at $499 bundled with the controllers, the Odyssey isn't really in the realm of "affordable" VR. In fact it now matches the Oculus Rift, which has been creeping down in price since launch. It also means that Samsung is now competing with Oculus at one end, while bolstering its efforts with Gear VR at the other. Interesting. Samsung's Odyssey raises the bar for Windows VR, but not at the expense of fragmenting the ecosystem, and we expect that even more players will come aboard if this whole virtual reality thing keeps gaining momentum. Where Microsoft might struggle most is in content, but now that Microsoft is working with SteamVR developers, that will hopefully change. Its acquisition of AltspaceVR is also promising for the social side. Yes, Samsung's proposition is more pricey, but I think it's good for Microsoft to prove it can go up against the bigger names in this space. It's only just begun, but for the first time I'm actually excited about Microsoft Mixed Reality.